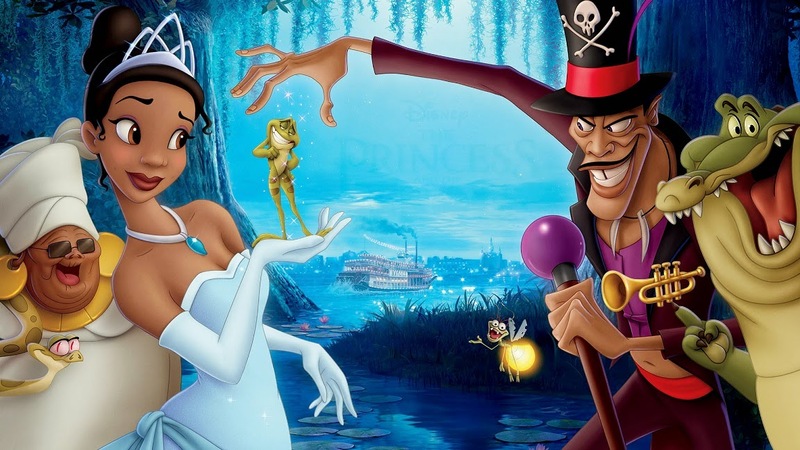 CommentaramaFilms: Is Disney’s Princess and the Frog Racist? 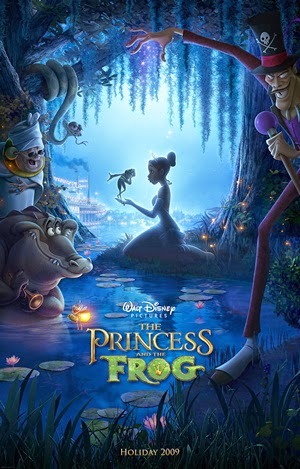 In its whole history, Disney has never had a black princess, at least until 2009 when it released The Princess and the Frog. 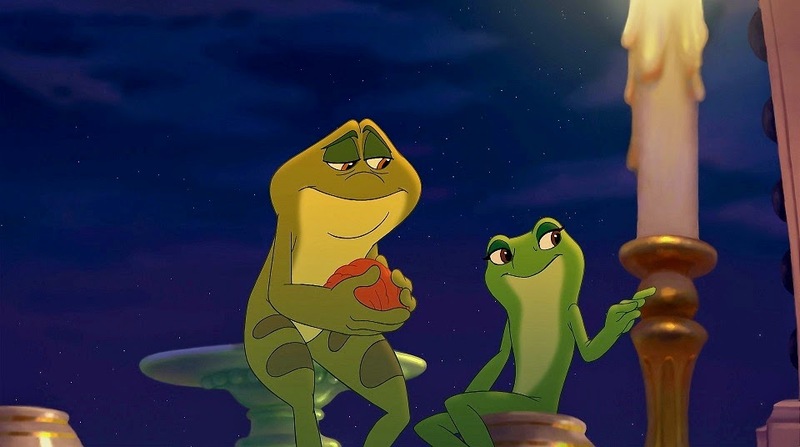 But The Princess and the Frog is not a cause for celebration, claims the aggrieved-left, because the film is racist! Only, it’s not. The Princess and the Frog is the story of Tiana, a black woman from New Orleans circa 1930s. She is a talented cook with dreams of opening her own restaurant, a dream she got from her father who has since passed. 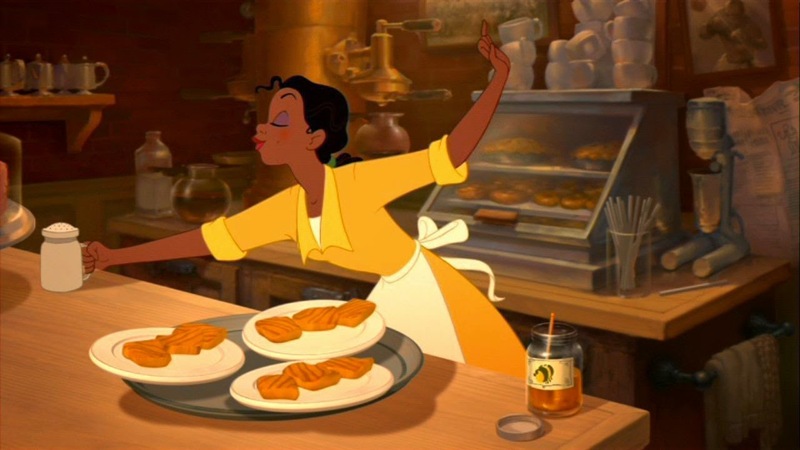 The story opens with Tiana working hard in a restaurant to save up enough money to buy an abandoned building to start her restaurant. She has finally saved enough! Hurray! Only, she's told that another buyer has appeared and she has only twenty-four hours to raise her offer, something she cannot do. Boo! Tiana's friend is a spoiled, rich white girl named Charlotte, who wants to marry a prince, and it just so happens that a prince has come to town. This is Prince Naveen, who has been cut off by his family because he’s worthless and lazy. He and Charlotte are a perfect match -- he has the title, she has the money. However, the next time Tiana meets Naveen, he has been turned into a frog by a Voodoo witch doctor, who is plotting with Naveen’s servant to replace the prince, marry Charlotte and steal her fortune. Naveen convinces Tiana to kiss him to change him back into human form so he can prevent this. In exchange, he promises to buy her the restaurant. She agrees, but when she kisses him, she turns into a frog herself. At this point, Naveen and Tiana must venture into the swamp to find Voodoo priestess Mama Odie so they can become human again. 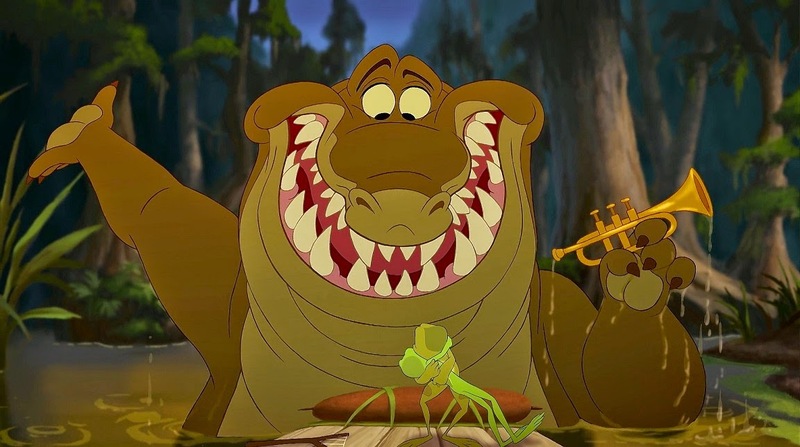 Accompanying them are Ray, a Cajun firefly, and Louis, a trumpet-playing alligator who wants to play jazz with the humans. Trying to stop them are the witch doctor and his army of shadow creatures. 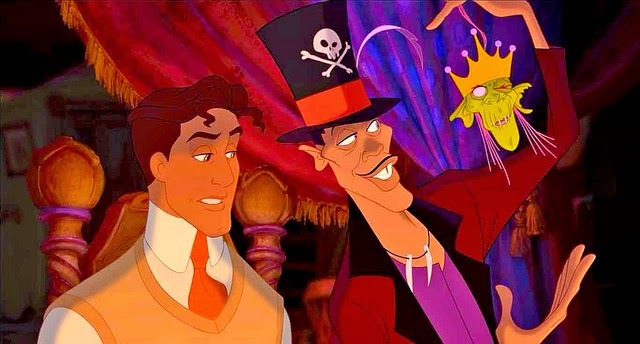 All in all, this was an excellent Disney film, easily the best after a miserable decade for Disney. The story is fast paced and relatable despite being both ethnic and deeply Louisiana. The art work is beautiful. Bits of the film are clever. And the songs are well done in a Broadway sort of way, which is greatly appreciated after Disney’s two decade use of ultra-bland, entirely forgettable corporate pop, like the song Elton John and Phil Collins kept passing off as different songs throughout the 1990s. So what could possibly be racist about this? Well, that’s a good question. Several attacks were made on this front. Some argued that it was racist that Disney's first and only black princess wasn’t born a princess and had, instead, to marry into it. Others argued that the film used black stereotypes. Neither argument is valid. That Tiana isn’t a princess is a key plot point which makes the story work. It isn’t meant as a sleight or to devalue her character either. To the contrary, her character is easily the most noble in the story. Nor is there any suggestion of a racial component to her lack of princess status. In other words, there isn’t a single suggestion, spoken or implied, that her race is the reason she isn’t a princess to begin with. And it’s not like all Disney females are princesses (see e.g., Penny, Jenny, Alice, Eilonwy, Meg, Jane). Essentially, the only way to see the decision to start her as a commoner as being a decision based on race is to assume that based on her race alone. The stereotype argument is even worse. For one thing, there are no negative black stereotypes presented. Each of the black characters is presented as smart, capable, and (except for the villain) strongly pro-family and pro-community. Nobody is living on welfare, selling drugs or having kids out of wedlock. Nor are there any presentations that fit the “Uncle Tom” mold. The closest would be Tiana’s mother, but she’s not a servant; she’s an ultra-talented seamstress and business owner. Indeed, the more you look, the harder it becomes to find any black stereotypes. What you see instead are Louisiana stereotypes aplenty. You have toothless Cajuns, everyone being a jazz player, voodoo princesses and witch doctors, corrupt-but-lovable parish politicians, gumbo-lovers, etc. Similarly, you have all the trappings of New Orleans: the bayou, gumbo, riverboats, the light rail, gators, etc. Everything in this film is regional rather than racial. I think where the “racist” argument springs from is the idea that it’s somehow racist to show blacks in roles they occupied historically if they are shown to be happy and not the victims of white oppression. Hence, the fact that Tiana doesn’t struggle against white oppression offends the aggrieved left as a whitewash. That is ridiculous, however. In fact, if you think about it, this argument would relegate every black story to being about white racism, and blacks could never tell their own stories without the focus being on whites. Now THAT would be racist! Another claim was that it was racist because she fell in love with a non-black man. Which says more about the person making the accusation than the film itself. 2nd, that it "whitewashed" history by not depicting the racism of the era and the fact that at the end she and the prince technically break the law by getting together (miscegenation). To that I would say, and HEAVY SPOILERS FOLLOWING! (3) most Disney movies are a historical whitewash anyway. In fact, her and the white(-ish) prince getting together and running a store in New Orleans is far more likely than a lowly Cinderella marrying a prince and eventually becoming (we assume) his queen. Personally, as an aside, I found the songs largely forgettable except for "Friends on the Other Side". Which is one of my favorite songs. But I might watch it again and decide. Also, I liked Elton John's work on Lion King, but that might possibly because it was done with the cooperation of Tim Rice. Phill Collins? Eh, it was ok. At least in Tarzan. Again... ok. Emphasis on "Ok", though "You'll be in my heart" is great. Kit, I had heard the interracial bit too, but as you say, that tells us something about the people who would say that, but it says nothing about the story itself. Also, in truth, I wasn't sure what Naveen is supposed to be racially. He seems to be an "other" category that you can't put your finger on -- probably so everyone can see what they want in him. In terms of the songs, I like the one Elton John song that hit the radio from the Lion King... but then he just kept repeating it over and over. Then they hired Phil Collins and he kept repeating it. I compare that to anything from early Disney through the 1970s where I can literally sing all of the songs today. The songs in this film are much more memorable, IMO, than the John/Collins stuff, but they certainly aren't to the level of "The Bear Necessities" or "When You Wish Upon A Star" or "Bibbiddi-Bobbidi-Boo." They are at least pleasant, distinct, and they relate to what is happening in the film at that time. Naveen is an Arabish name. But he is implied to be from Southern Europe so he's supposed to be... Mediterrabian. I think the Elton John songs of Lion King worked quite well and are far more memorable than this one's songs. "Circle of Life", "I can't Wait to be King", "Hakuna Matata", and "Can You Feel the Love Tonight". All wonderful, brilliant songs that work well within the movie. The Phil Collins songs for Tarzan were good (It is Phill Collins) but were not great DIsney songs w/ too many sung by Phil Collins in the movie, unlike Lion King where the characters sang the songs in-movie. Still good, listenable songs, though. I concur, the only ones who are being racist are the professional victims/extortioners who, once again are trying to sell their stupid, bitter ideology through something that is good. Actually, Eilonwy is a princess by birth. Disney just refuses to openly acknowledge her because they generally see The Black Cauldron as an embarrassment. I do remember the hubbub about this flick. There was so much terror at having Tiana look like a stereotypical “mammy” black character that they changed her name from “Maddy” to Tiana and changed her original profession from a chambermaid. I was just floored by it. Does anyone truly think Disney, a very politically correct bunch of folks, is going to depict blacks in a derogatory way? I live in the New Orleans area and I got a kick out of all the Louisiana stereotypes. Gumbo, cay-juuun accents, and a Jazz-playing gator named, of course, Louie! Love that! Jason, I LOVE Louie! He's a fantastic character in so many ways! I don't know what people are thinking. Disney is probably the last company on Earth that would do anything racist. To the contrary, they have always gone out of their way to be positive about every race. I think this was just the typical race baiter crowd looking to push the idea that everything is racists in someway. Huh, I didn't think Eilonwy was a princess. Ok, I stand corrected. Thanks Ben! I agree. I don't think you can watch this film and objectively feel that anything racist is going on or was intended. You need to want to see racism for there to be racism, and even then, you're just making it up. Kit, Naveen is an Arabic sounding name, but he comes from a made up Kingdom with a mixed-race population and a sort of French accent. I suspect the intent was to make him North African of non-determinant race. We can agree to disagree on the songs, but I can tell you that few people I've met have any ability to sing the songs of 1990s, but they can sing all the old ones. Naveen is an Indian name, specifically Sanskrit. And I suspect that race is chosen because it meets two criteria: one, India seems to vomit princes into the world, so it's an easy archetype and two, an Indian prince allows the artists to draw him with a faint Anglo edge that, just as Andrew suggests, lets the audience see what they want to see. I saw this movie, loved the N'awlins setting and flare (lived there a spell, wayyyy back in my youth), but didn't find it memorable, nor have I gone back to watch again. Good flick, tho. Side note: we've seen such nonsense from Libs before, where they accuse a show of racism when it in fact elevates the minority race characters. My favorite example will always be the Cosby Show, which gave us a stable, aspirational black family headed by two successful career parents, both of whom were strong characters whose flaws were no worse than charming. Before it dominated the ratings, the show was accused of being racist because it was an "unrealistic" portrayal of African Americans (a doctor and a lawyer marrying each other - who ever of black people doing such a thing?) - which of course speaks volumes about the prejudices of the critic. I think that the left's problem is that it is entirely class-obsessed and has been since the days of the Articles of Confederation. The Libs of today really are the natural offspring of the Plantation Democrats. They find their comfort in a society divided by class and anything that threatens it - or works of art demonstrating success in defying class - is a threat to their world view. I have had to take a lot of diversity courses at work - racism, genderism, ageism and on and on - and every course starts exactly the same way: the instructor classify everyone in the room. They put labels on you first and then the training is oriented to the class or stereotype with which you have been labelled. Irony, I calls that. Andrew might call it, what ... cynicism? Of course, there’s nothing really new about it, but it draws attention to say it that way. Simple minds imagining themselves to be clever have always been able to project their own obsessions into the words and deeds of others. The American national obsession is race, so the formula goes: here is a situation; find the racism in it. KRS, It is indeed the left that is obsessed with dividing people into groups, even as they claim they are trying to unite people... unite in their opposition to each other, I guess. And the diversity people are the worst. I think you're right too about Cosby and other similar attacks. The assumption seems to be on the left that there is only one valid way to portray blacks - living in unhappy poverty. tryanmax, Great way to crystallize the issue: "racism is when white people do stuff." That really sums up the "logic" behind all the bizarre claims of racism. Agreed on people projecting their own obsessions. That's exactly what this is. As an aside, a group of Religious Right types attacked the film for showing voodoo in a positive light. Good grief. Its almost as if they don't want blacks to be shown being able to succeed in America. I think that's what it is, quite frankly. Similarly, they don't want to see people of different races get along. They don't want to see married women be happy. Etc. It's all part of their ideological game. The thing about class is ... as long as you're not in the lowest class, you get to be better than someone forever. The air of superiority exhaled by libs, progs, slave owners, etc., is pervasive. And, you don't have to be in the top class to experience it; even Huckleberry Finn thought himself naturally superior to Jim - for a while. That's why we're 'dumb' or 'racist' or we 'act white.' It's not just a way to dismiss our views - they really see us as genuinely inferior. I, honestly, didn't think about that argument. Now, it's a new thing to include on the list of things I hate about films involving different race/religion/any conflict. Aside from the fact that it NEEDS to be European men doing the persecution, it also needs to show people struggling beneath it, almost as if the idea of people actually finding joy during those times was unthinkable. And you're right, it takes the stories that minorities want to tell and instead are told what stories they should be telling. Honestly, the more I look into this, I find that hard-leftists tend to be more racist than they claim those on the right are. Honestly, I found this film to be enjoyable. While it's not my all-time favorite Disney movie (I personally give that to Lion King), I still found it to be good. This reminds me of the lefties who work hard to come up with "dog whistle" words or phrases that white conservatives use. I must've missed the memorandum where white people secretly meet to invent these dog whistle, racist words so we can be racist in secret. Only lefties and dogs can detect them. Incidently, my dogs are mostly black, but they are uncle Tom dogs so they don't mind the dog whistle words I use (taught by mostly liberal teachers of the 70's no less, but in all fairness, they hadn't broken the code in the 60's and 70's, so they get a pass). Dog whistle phrase of the day: poop deck. KRS, That's very true. So long as you aren't in the bottom, you can feel smug that you are better than "those inferiors" who cause their own problems with their lack of work ethic/values. At the same time, you can convince yourself that the people in the classes above you are out-of-touch or immoral or corrupt. It's a great way to make yourself feel morally superior. Tohokari, I wouldn't call this a favorite either, but I think it was a solid comeback after a period that wasn't very memorable. I agree completely about the left being racist. They want to see minorities as helpless beings who need suffer under the evil oppression of everyone else and need good white liberals to free them. The idea that they could be happy or self-reliant is anathema too these liberals. Ben, It's amazing how almost anything some white conservative says will bring out someone from the race baiting community to scream that this was a code work or something like that. It really shows just how sick their thought processes are.